David Edwards is married to Alison (25 years in July 2017) and they have three children. He works as a Shift Performance Manager in Passenger Service at Gatwick Airport. David served in the Royal Engineers joining straight from school. He qualified as an Electrical Engineer and served for eight years. 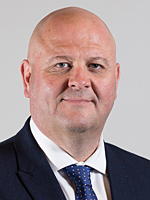 David has been a member of Arun District Council since 2011 representing Felpham East. He was also Chairman of Felpham Parish Council from 2015 to 2017. He sings in a Trio called 'The Debonaires', gigging locally, and also appeared at the Conservative Party Conference in Birmingham in 2016.